Audre Lorde (1934-1992) is one of my favorite poets; links to my previous postings of her work in this blog are given below. Here is the opening poem from one of Lorde's collections, The Marvelous Arithmetics of Distance. According to Google, these posts are the top ten favorites of visitors to this blog in the six years since my first posting in March, 2010. Perhaps you will want to visit one of them. Or use the SEARCH box to find something favorite of your own. I invite your comments. Which posts do you especially like? 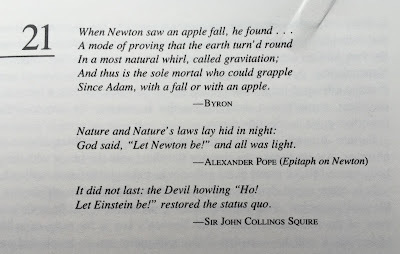 Introductory quotes for Section 21 ("The New Law of Gravitation and the Old Law" by Sir Arthur Stanley Eddington) of Part V (on page 1073 of Volume Two) of James R. Newman's The World of Mathematics. 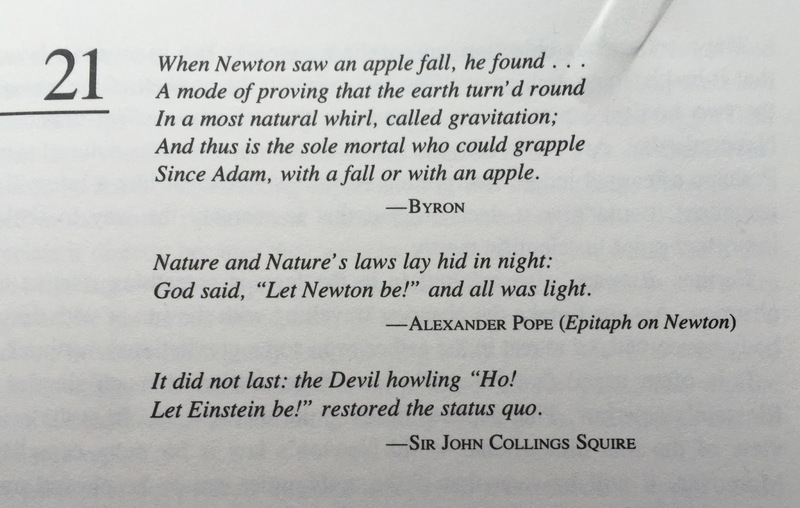 Here are links to information about the poets named above: Lord Byron (1788-1824), Alexander Pope (1688-1744), and Sir John Collings Squire (1884-1958) -- and these links lead to previous blog postings that feature The World of Mathematics: March 22, 2011 and August 2, 2011. How Old Is the Rose-Red City? Most of Martin Gardner's fans are avid puzzler's -- my connection with him is also one of admiration (he was a thoughtful person who was a master at making connections among disparate things) but we are connected via poetry, including topics such as counting all possible rhyme schemes for a given stanza and the constraint-based poetry of OULIPO . . ..
Gardner (1914-2010) was not a poet -- although he penned a quatrain or two, his great contribution was collecting and publicizing parodies and puzzle-verses by others. Here is a link to Gardner's collection of poetic parodies, and here is a link to many of Gardner's puzzles, including the stanza below, "How Old is the Rose-Red City?" Your best choice is my demise. My wise choice is your defeat. South Dakota mathematician Daniel May enjoys finding connections between his discipline and other arts -- and herein we consider a constraint-structure for poetry that he has developed using a Fano plane. 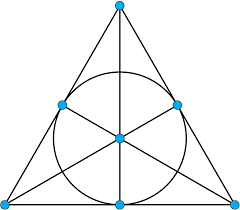 In brief, a Fano plane (shown in the diagram below) consists of 7 points and 7 lines (the three sides of the triangle, the three altitudes of the triangle, and the circle) -- with each line containing 3 of the points. An Australian poet (Erica Jolly) whom I have met through this blog has helped me to learn about the great variety of poetry and related activities that are available on her continent -- and today I want to link you to the Australian Poetry Library and to offer a mathy poem by Peter Goldsworthy that I enjoyed there.